Killer Mike's R.A.P. Music was one of my favorite records of 2012. The video for Reagan is a cartoon depicting the lyrics of the song and it is shocking the first time you watch it, especially if it's your first experience with the song. Killer Mike is saying things that you're not supposed to say and it's not shock for the sake of shock. He's not trying to gross us out like Odd Future. He's not just saying whatever funny, nonsensical thing is passing through his brain like Lil' Wayne and he's not trapped in his own head/ego like Kanye West. Killer Mike's lyrics sound important and they make you pay attention. You may or may not agree with his message but you'll certainly know what his message is before the song is over. Tomorrow night's show at the Mohawk would be worth your time and money even if it were only Killer Mike on the stage but that's not the case y'all. 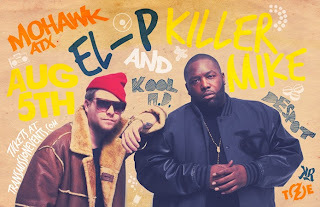 No, for those of you who didn't realize it already based on the title of this very post, the legendary, El-P will also be performing in Austin Monday night along-side Killer Mike at the Mohawk. Together they are known as, Run the Jewels and they just put out a new record on Fool's Gold Records. El-P's importance to hip-hop cannot be overstated. I know I started this post focusing on Mike, but El-P is a legend in his own right. He's a hip-hop producer, performer, entrepreneur, and all around mogul. If this post is your first time seeing the name El-P then I almost don't even know where to begin. 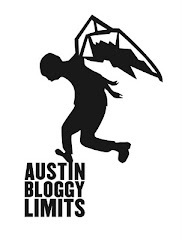 I'm going to assume that if you're hip to Austin Bloggy Limits you have a basic, working knowledge of who El-P is or at least a basic working knowledge of how to use the internet. So, for our purposes today, I'm not going to get into all of that. I'm just going to say, respect and highlight that not only did El-P produce the Killer Mike album I discussed above the break, he released his own killer rap album, Cancer 4 Cure C4C, which also ranked amongst my favorite albums of 2012. I don't know for sure, but I would expect that we'll get to hear solo material from both artists along with their Run The Jewels material. Both individual artists have catalogues that reach back a decade or more, so the setlist will have to be somewhat focused on their most contemporary stuff. Since tomorrow is Monday and this show will be taking place on the outside stage at the Mohawk it will start and end early. The doors open at 6:30 and I would expect the whole event to be done by 10:30 or earlier. I don't know this for a fact, it's just some good guestimating.